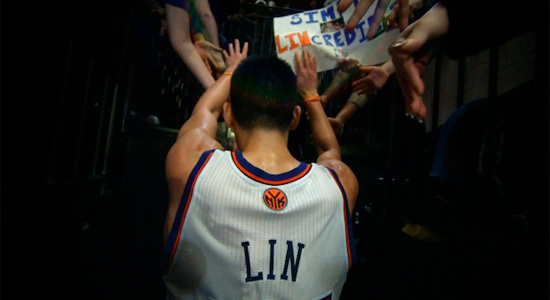 In the opening moments of director Evan Jackson Leong's documentary Linsanity, professional basketball player Jeremy Lin recalls the time that security stopped him as he walked into the player's entrance of Madison Square Gardens. They didn't recognize he actually played on the team and thought he might be a trainer. Those guys certainly weren't the only ones who didn't notice Lin, but the entire world was about to witness a meteoric rise unlike any in professional sports as the 24-year-old Harvard graduate went from an unknown to an international superstar over the course of only two weeks in 2012. Read on! Leong and his crew began filming long before the crazy hype began, telling the story of how Lin overcame massive odds to lead his high school team to a state championship, despite the opposition having eight players that stood over 6'6”. (Those of you who know basketball will know how impressive that is.) Even after the win and his exceptional high school career, Lin wasn't actively recruited by top college squads, something he attributed to his being an Asian American player. The topic of race is brought up multiple times in the film, from Jeremy's early struggles to his days playing at Harvard and enduring racist taunts from opposing Ivy League fans, and even the mass media's reaction after he became a pop culture icon. Jeremy's faith is also a focus for the filmmakers. The "t" in the title card for Linsanity is a Christian cross, and while the film spends some time on Jeremy reaching out and spreading the gospel to kids at basketball camps, it's not an overly evangelical story. Those who share Jeremy's beliefs should find his actions and attitude encouraging and uplifting, but his faith doesn't dominate the film in a way that turns you off to it. It's a prism through which Jeremy deals with his own internal struggles, and listening to him speak about it humanizes him and gives the film a more personal and engaging feel. We also get some candid moments with Jeremy himself, and discover that while some may have seen him as the new Messiah of basketball, he's just a down to Earth dude who loves singing karaoke versions of classic Disney movie songs. Through interviews with friends, family, sports journalists, coaches, and more, the movie allows the audience to get to know Jeremy as a person as well as a player. Even if you're not a fan of basketball, Linsanity works as a character study of a humble kid whose hard work was rewarded with an extraordinary opportunity. When the "Linsanity" - aka the media hype - begins to go crazy following a string of amazing games from Jeremy, the film really finds its footing. Watching them live on television was one thing, but it's so much fun to relive all of these amazing moments on a huge theater screen; you wouldn't believe these things happened if they were written by Hollywood's best screenwriters, but Jeremy's incredible story transcended the sports world and captivated the globe. Watching Jeremy's rise to fame means so much more when you know where he came from. It's crazy to think that just under a year ago, he was sleeping on his brother's couch in a New York apartment because he wasn't sure if the Knicks would keep him on the team or not. The movie ends on a high note which doesn't exactly mirror how Lin's career has played out thus far (he was traded to the Houston Rockets and hasn't been putting up the astronomical numbers that he did during his peak), but it's the perfect place to end this documentary. Linsanity is so good that it gave me chills multiple times; it's inspirational, heartfelt, thrilling, the underdog story of all underdog stories, and it gives a human face to a modern sports legend. He actually signed outright with the Rockets, he wasn't traded. He's gone on to be a quality starting point guard for a good team. I'd say that is a fitting outcome for Linsanity to this point. No one expected to him to put up the crazy numbers from that short time with the Knicks for the rest of his career. I concur with everything Jay said. I'll also add the deal was best for both parties involved. Can't wait to see the movie (or DVD), whichever comes first! Jeremy is an inspiration to all Asian or alike underdogs who think doors have been closed for them, to show them that God is opening another window for you, if you just work hard and don't give up! And joining the Rockets turns out to be good for him as it gives him 3 years to grow with the young players, not pressured in the Big Apple with the superstars. can't wait to see the movie and have the DVD. He might have been sleeping on his brother's couch on some nights in NY, but the phenomenon that's known to the world was --He was sleeping on team mate Landry Fields's couch on the night before Linsanity exploded on Feb 4, 2012 when he led the Knicks to win over Nets. hehe, let me try to post a picture of the couch that he slept on in Landry's home.